If the Trans Polar Stream has less ice, it also means less momentum and continuity pushing sea ice towards the Atlantic, this is what we are observing with JAXA August 27 through to 30 above. Hence a retreat throughout the Atlantic Front and even if not seen with HRPT photos, a lot of Goodbye Waves signifying rapid melting. It is a reverse flow mirage which has something to do in part with the broken off flow momentum pushing dense sea ice outwards and Cyclone Centre pushing winds Eastward. Goodbye Waves along with very thin emaciated ready to melt sea ice near Wrangel Island August 30, the thin ice almost looks like goodbye waves but they are not quite alike. August 27-28 , JAXA depiction is fairly good , but there is a mix between Goodbye Waves and sea ice, seen on 28 apparently having more sea ice, although the two are from sea ice, they are definitely not alike, the prominent gap breaking up the ice bridge in two is more prominent on NASA EOSDIS capture (above), the bridge is no more, what is left is going goodbye. Goodbye Waves likely caused this confusion. Look at the 2nd arm of the ice bridge reappearing on August 28. North Pole proximity had the visit of an important cyclone approximately 974 mb for about half a day. Again a great deal of open water was created near or at its centre. This prompts the idea of cross checking the real cyclone centre with sea ice imprints, the same goes for very High pressures. Wrangel Island ice bridge methodically becoming no more. Trans Polar Stream, first time so wet in history, is simply huge, it may cause a fluid mix accelerating flushing to the warm North Atlantic. Fram Strait is rapidly bulging Southwards with sea ice, this means that the Open Trans Polar Stream may reach the Strait, with 0 to +7 C sea surface temperatures. Notice Goodbye waves between Greenland and Spitsbergen Isles, they expanded from August 23 to 25 as well, a sure indication of rapid melting along with the arrival of new sea ice. If the Trans Polar Stream open zone reaches Fram Strait, it would mean a much more fluid flow of sea ice to the North Atlantic. There is a sea ice lake, the size of Lake Superior, 85N 135E, the remnant of GAC3 again dispersing ice at Centre of this Cyclone. 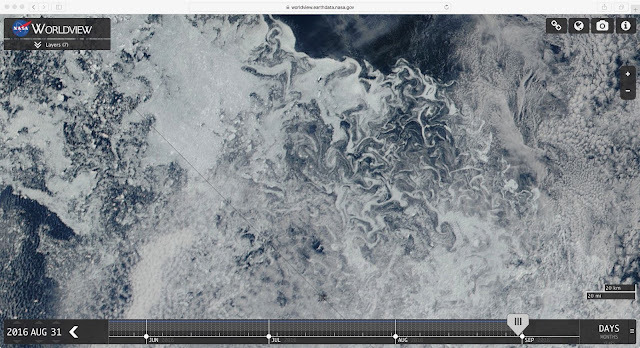 The Wrangel Island ice bridge seems on the verge of total collapse. The other, towards Laptev sea, only has less than 1/3 of its pack apparently solid. The Atlantic Front appears to be moving North. There is significant extent numbers consisting of 80% or more of seawater, which would count as 100% sea ice. Compaction vs scattering, sea ice movement favours some extent gains on the leeward side until spreading gets water to be prominent. Towards the left, captures file. ~"to the right" of wind direction- -+ sea ice dispersion is not easily captured. ~ Melt rates vary in steps associated with Low pressure movement. ~ Following scattering slow down, today's extent drop is the largest in August 16 history (2002-2016) 109,341 km2. ~ Rotation of entire sea ice pack appears to be counterclockwise. ~ Low pressure centre still not at the Pole, most of yesterdays sea lakes vanished by strong winds. ~ Cyclone centre expanded near adjoining sea water areas. Most August 15 great lakes creations by smaller Low were "closed" by wind movement away from the centre of the new Cyclone. However there is far larger opening at 85 N than the day prior. The Pack From Fram Strait to Banks Island Canada seems rotating counter clockwise. The counterclockwise rotation of the entire pack has doomed the Wrangel Island sea ice panhandle much quicker, warmer sea water is about to seriously invade the Laptev sea region as well. The expansion of open sea water at the North Pole has started by the older Low which deepened just before it merged prior to 18 utc with the GAC of summer 2016. This expansion was expected, but not quite like captured by AMSR2. Latest 880 mb Cyclone was right over Laptev sea yesterday. This is not a see through cyclone, rather moderate to strong, we can only see its after effects once passed. For better understanding of over sea ice floes interactions we must look at just prior sea ice movements. East of Franz Joseph Lands, Sea Ice was mainly moving South. Notice near Ostrov Komsomolets likely Southwards moving ice but melting, leaving a stable but badly shattered ice front with Goodbye Waves. Scant near North Pole visuals; sea ice is badly broken up towards the Atlantic Front. All along the North Atlantic sea ice front, about 1200 Kilometres long, there are numerous new 'Goodbye' waves, sure evidence of recent massive melting. From Fram Strait, to North of Spitsbergen to beyond Franz Josef lands, as seen here in our roving NASA EOSDIS shots. Although the newish extended sea ice front line position has recently expanded and appears more or less stable, that is an illusion, the sea ice melts just as fast as it touches warmer water. The end result is a great loss of sea ice. Assume Southwards sea ice movement a modest fluid 2 kilometres an hour , about 48 kilometres a day melt along apparently a steady front, potentially 60,000 km2 a day loss is possible, without actual remote sensing detection. WDAugust10 2016. Individuals always melt away to darkness. Fram Strait layered Goodbye waves join the ether of the sea. Rapidly melting sea ice bounces about by collisions with others, current and winds. Goodbye waves seem curved and move more uniformly. Like clouds a top the ocean. Beaufort Sea July 22 August 5 AMSR2 result. Massive area of 'Goodbye' waves didn't really show up on JAXA which is very interesting, it rather means that they are essentially slush, otherwise need be confirmed as such.